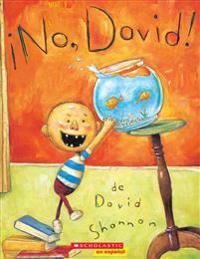 When David Shannon was five years old, he wrote and illustrated his first book. On every page were these words: NO, DAVID . . . and a picture of David doing things he was not supposed to do. Now David is all grown up. But some things never change. . . .
NO, DAVID remains a perennial household favorite, delighting children, parents, and teachers alike. David is a beloved character, whose unabashed good humor, mischievous smile, and laughter-inducing antics underline the love parents have for their children--even when they misbehave. Now available in Spanish David Shannon escribi e ilustr su primer libro cuando ten a cinco a os, y en cada p gina del libro aparec a la frase " No, David " y alguna imagen de David haciendo algo indebido. Hoy en d a, David es un adulto. Pero algunas cosas nunca cambian. Este libro en espa ol deleitar a ni os, padres y maestros.